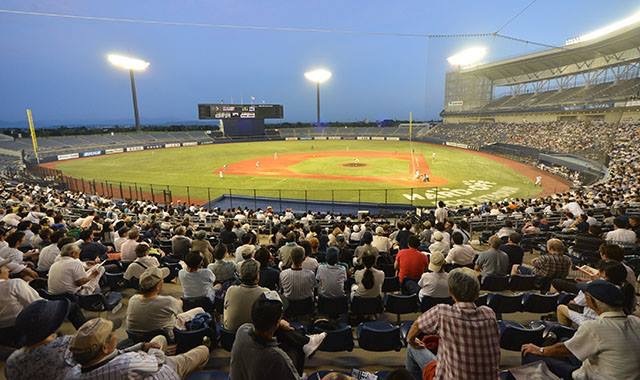 (USA Baseball July 12, 2016 NIIGATA) - The 40th edition of the USA-Japan International Collegiate Friendship Series opened with a hard-fought, well-pitched game but the USA Baseball Collegiate National Team fell just short, dropping a 2-1 contest on Tuesday at Hard-Off Eco Stadium in Niigata. 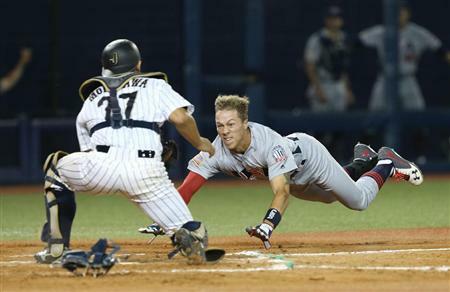 Team USA pitchers Tanner Houck (Missouri) and JB Bukauskas (North Carolina) held Japan hitless for all but one inning in the series opener, but a pair of infield singles and seeing-eye base hit proved to be the difference in the contest. The U.S. opened the scoring in the second when Mike Rivera (Florida) punched a two-strike, two-out single through the left side to plate Brendan McKay (Louisville) from second. Team USA went on to load the bases later in the frame but Japanese starting pitcher Chiharu Sasaki got a flyball to escape without further damage. Houck, meanwhile, cruised through the first four innings of the contest. The Team USA starter needed just 37 pitches to do so. In the fifth, however, back-to-back infield singles and a hit batter quickly loaded the bases for Japan with just one out. Taiki Morikawa then found a hole with a bouncer to the right side of the infield which went for a two-run single that eventually proved to be the difference in the game. From that point on, both pitching staffs took over. Bukauskas sat down all nine batters in his three innings of relief for Team USA and Sasaki retired 17 of the last 18 hitters he faced. Sasaki earned the win on Tuesday after going seven strong innings with 12 strikeouts and just the one run allowed. Hiromasa Saito and Ichiro Tamura then threw one scoreless stanza each to close out the game for Japan. The two teams will return to Hard-Off Eco Stadium again on Wednesday for another 6 p.m. local time/5 a.m. ET showdown. Right-hander Alex Faedo (Florida) will start for the U.S. while Japan will counter with a righty of its own in team captain Yuya Yanagi. "This was a good baseball game. I liked the mindset of our players. It was a very exciting environment, tremendous stadium. We knew we were playing a good baseball team and they did what we thought the Japanese team would do. They threw a lot of strikes, they put the ball in play and they played good defense. To not strike out against the two pitchers we used today is tremendous. When you do those things, you are going to be in every single game. We fought hard but the story of the game was one inning where they put the ball in play and we struck out too many times. Our plan tomorrow will be to have more competitive at-bats right out of the gate." "Whenever a pitcher can throw cross-count, pitch backwards, and throw changeups for strikes when he is behind in the count, which he did, it puts a little doubt in the minds of the hitters and keeps them off balance. Not only was his fastball lively and he had good command, nothing down the middle, but he was able to cross-count and pitch effectively out of the zone when he wanted to." "The Japanese hitters are really good, whether they are ahead in the count or behind in the count. They always put the ball in and don't strike out, which we saw tonight. They laid off some good pitches that I threw and were just a competitive team at the plate. We have to continue to attack as a staff. It worked all the way up to the fifth inning when they got the two runs but even then they had a lot of groundball hits." "It was just a two-strike swing. I wasn't trying to do too much, just put the ball in play. I just wanted to stay short, put the barrel on it and wherever it goes, it goes.